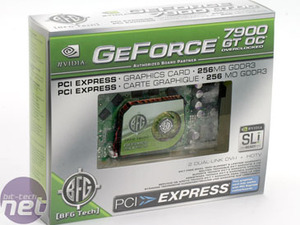 Back on March 9th, NVIDIA announced the GeForce 7900 GTX, GeForce 7900 GT and the GeForce 7600 GT. 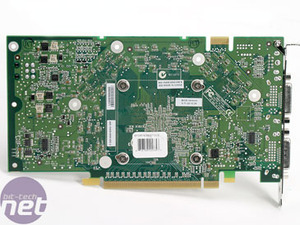 We've already had a look at the performance of the GeForce 7900 GTX and the GeForce 7600 GT, but we were missing the final link in the chain to complete the set. Summer isn't far away now, and it makes for a good time to upgrade your graphics card in time for some of the headline games that will be announced at this year's E3 gaming festival. 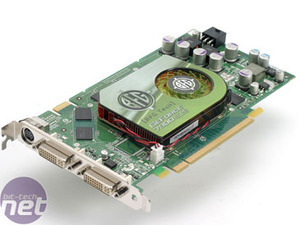 Or maybe you've got a GeForce 7800 GT or Radeon X1800XL and you're dying to get a higher frame rate with better detail settings in Elder Scrolls IV: Oblivion so you can enjoy the game even more? All of BFG Tech's video card range comes with a full lifetime warranty and the cards are clocked higher than the NVIDIA reference clocks. Many of NVIDIA's partners out-do them in the clock speed arena but there are few who offer the same comprehensive warranty services. We've tested it out ourselves and found that it was a very good experience - our card was turned around in a good amount of time considering it had to be shipped to the USA from the UK. The card is packed in BFG Tech's standard packaging, which could be improved a little. The card is in a plastic mould shell inside the box, but it isn't secured tightly. It can rattle around inside the box - that could possibly result in a damaged card during shipping. The chance of that happening is unlikely, but it's something worth bearing in mind. The bundle is the bare minimum for getting the card working. 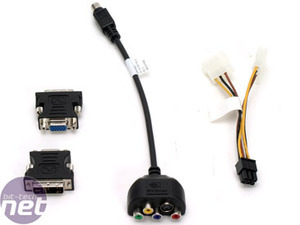 There are two DVI-to-VGA adapters, an HDTV-out breakout cable and a 6-pin PCI-Express power adapter. The HDTV breakout cable has connections for S-Video, composite and YPbPr component out. BFG has rounded the bundle off with a driver CD and a quick install guide. 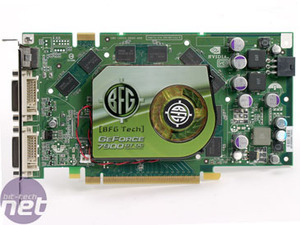 The board is just like any other GeForce 7900 GT and it has the same small cooler on it - obviously, this one is BFG Tech branded. It's quite amazing to think that NVIDIA is able to cool a £200-plus video card with such a small and insignifcant cooling solution. 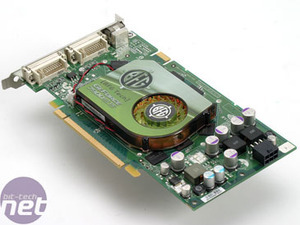 In fact, it's almost like NVIDIA is showing off because it's the same cooler that is used on the NVIDIA GeForce 7600 GT. The noise that the cooler emits is less than fantastic. The pitch doesn't change between 2D and 3D work loads, because the cooler is already running at 100% in 2D mode. We feel that it would have been better to for NVIDIA to put a larger, quieter single slot cooler on its reference design, as it would mean that noise is less of an issue. While this heatsink/fan combination isn't as noisy as the coolers on the Radeon X1800XL and GeForce 7800 GT, we'd recommend changing it for something more substantial.